This baked polenta dish is made with a rich and flavourful beef and sausage ragu then is topped with creamy polenta and baked in the oven. A delicious comfort food dish to keep you warm this winter. 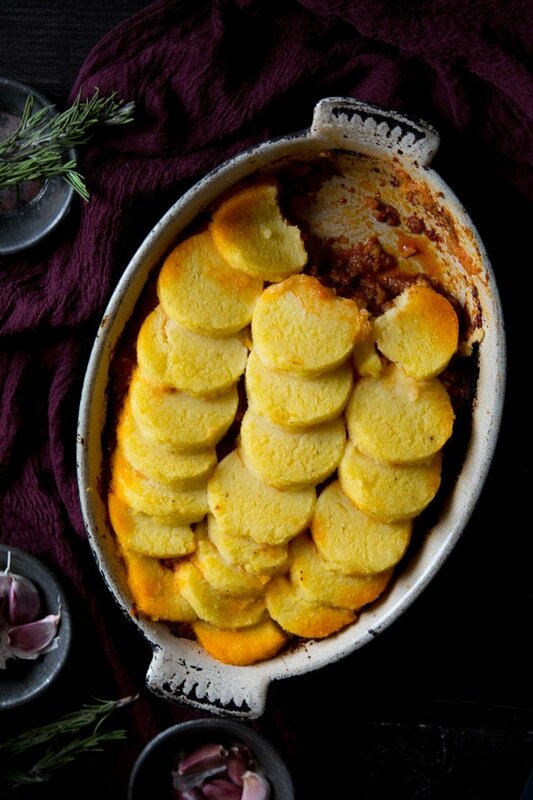 This time of year is all about comfort food, easy, delicious, hearty food that keeps you feeling cozy when it’s bitterly cold outside and this baked polenta and beef and sausage ragu does exactly that. Polenta is so easy to make, it’s creamy and smooth and can be eaten as it is or left to go firm then grilled or baked. I love a big bowl of creamy and comforting polenta with a stew that’s been simmering away all afternoon. You can add any good melting cheese to polenta with butter and it tastes pretty much like heaven and it’s a great alternative to mashed potatoes. For this recipe, I made the polenta with parmesan and butter then poured it into a baking tray to firm up. I then cut it into rounds and added it on top of an insanely delicious beef and sausage ragu. It’s baked in the oven which creates a lovely crunchy, crust on top of the baked polenta yet keeping it soft and creamy on the inside. The ragu is rich and delicious and goes perfectly with the polenta on top. Finely chop the carrot, onion, celery and garlic. Add everything apart from the garlic to a large pan with the olive oil and saute gently for around 6-7 minutes until the veg is soft but not browned. 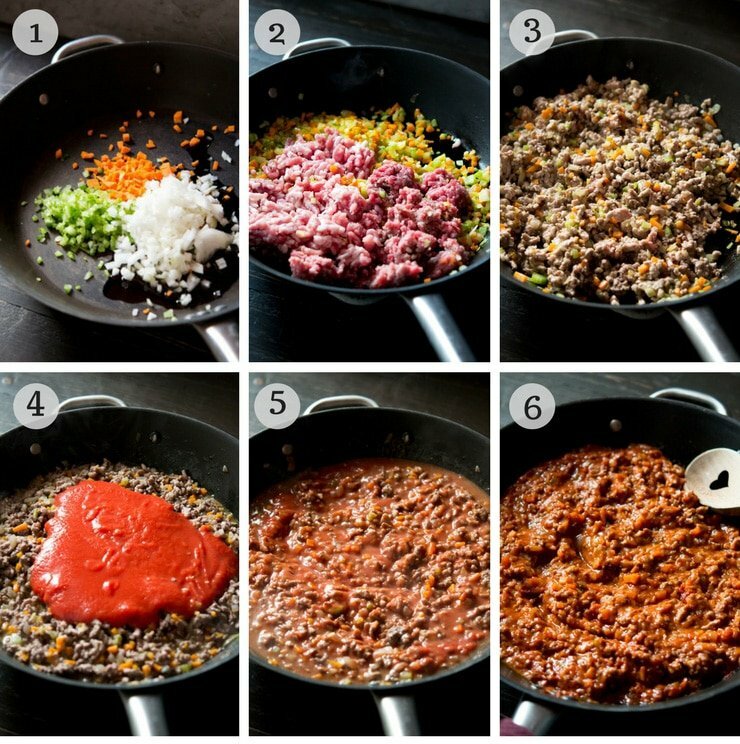 Add the beef mince, sausage meat removed from their skins and garlic to the pan and brown the meat. If a lot of fat comes out of the sausages, spoon some of the excess out. Once browned add the wine and let it reduce by half. Then add the passata/pureed tomatoes with a couple tbsp of water and a good pinch of salt and pepper. Stir the ragu so everything is combined and let it simmer gently, covered for 1 and a half to 2 hours. If the sauce reduces too much top it up with a little water. While the ragu is simmering, make the polenta. Bring 4 cups (1 litre) of water to a boil, add a good pinch of salt to the water. Pour the polenta into the water whilst constantly stirring. Turn the heat down to medium/low and keep stirring until the polenta becomes thick and smooth. Turn off the heat and add the butter and parmesan cheese, stir it into the polenta until melted. Check if it needs more seasoning and add accordingly. Pour the polenta onto a large baking tray and smooth it out. Let it cool then place in the fridge until the ragu is ready. When the ragu is ready, preheat the oven to 180°C/350F/gas mark 4. Transfer the ragu to a large baking dish. Remove the polenta from the fridge and cut out rounds using a cookie cutter or glass or cut it into strips and place them on top of the ragu. Bake in the oven for 30 minutes. The polenta will be slightly crunchy on top and the ragu bubbling, let it cool for 5 minutes then serve. If you’ve tried this baked polenta with beef and sausage ragu or any other recipe on the blog then don’t forget to rate the recipe and let me know how you got on in the comments below, I love hearing from you! You can also FOLLOW ME on FACEBOOK, TWITTER, INSTAGRAM and PINTEREST to see more delicious food and what I’m getting up to. 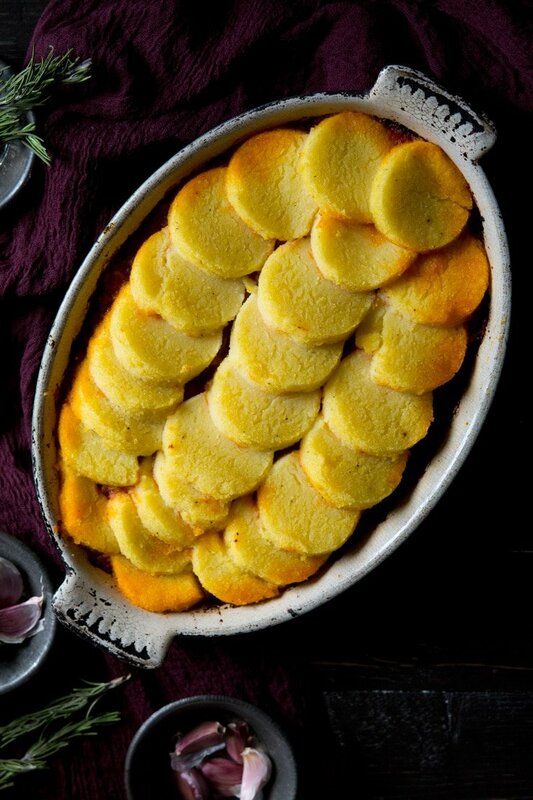 A rich and flavourful beef and sausage ragu topped with creamy polenta and baked in the oven. A delicious comfort food dish to keep you warm this winter. When the ragu is ready preheat the oven to 180°C/350F/gas mark 4. Transfer the ragu into a large baking dish. Remove the polenta from the fridge and cut out rounds using a cookie cutter or glass or cut it into strips and place them on top of the ragu. This is the ultimate comfort food for dinner!!! Making this asap! Thank you Marlee, I hope you enjoy! This looks like such a delicious and comforting recipe for cold winter nights! Definitely, it’s perfect at this time of year! Great recipe! I haven’t seen polenta presented this way. Great idea! Thanks for sharing it. Oh my word! This looks amazing! 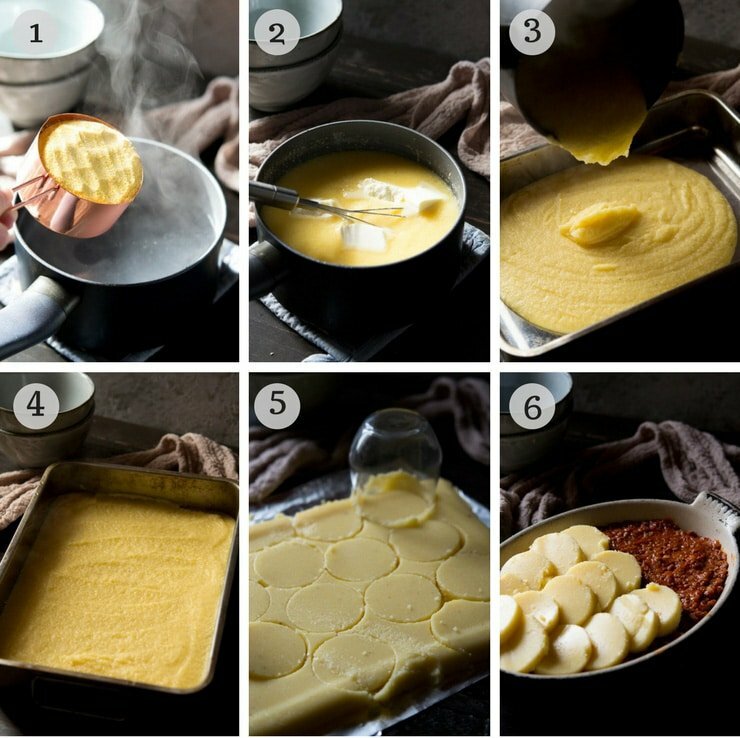 I’ve never tried making polenta – it looks so scrumptious – so melt in your mouth good! It’s proper comfort food, thanks Shashi! I really love the look of this! All my favourite flavours in one simple dish. I have to try it soon! Thanks so much Elizabeth, I hope you enjoy it! Polenta is a great alternative to mashed potatoes if you feel like something different and it’s delicious. Thanks Bintu. This looks amazing and it instantly made me hungry! This reminds me of grit cakes. My kind of comfort food. So simple to make too! I make a similar dish but I use grits. Thanks so much April, it sounds very similar! Polenta is such a comforting food to eat and oh-so-perfect at this time of year when the temperatures start to take a dip. Loving that you draped it over that cozy stew. I’m imaging having a nice big bowl while sitting in front of the fireplace. It definitely is, thanks so much Lynn! I’ve never tried baking polenta myself but it looks pretty straight forward. Thanks for the inspiration! I love that you made your polenta rounds from scratch and didn’t simply cut them from that plastic-wrapped tube at the store! This looks lovely! Thanks so much Alyssa, making it from scratch is 10x better and it’s so easy! Thanks so much Chris, I hope you enjoy!